Subject: FILL UP THE JOB APPLICATION AND INTERVIEW FORM AND SCAN IT BACK. NOTE: After your Job Application Form and Interview Form has been reviewed by our Employment Relations Board, selected candidate would be contacted for Appointment Letter that will help him to obtain his/her U.S.A Work permit visa for his job here in our organization. The Appointment/Offer Letter will indicate the job role and the amount that would be given to our selected candidates. 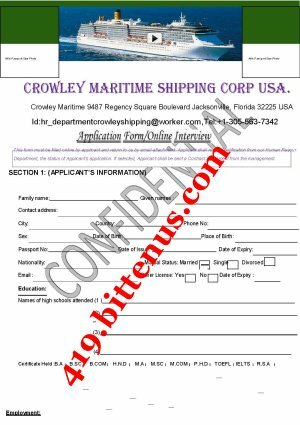 The Management of Crowley Maritime Shipping Company USA. Would apply for our selected candidates Visa[s]n their behalf by sending all documents required for their two years' work permit visa to the corresponding U.S Embassy in their country for Visa Application. *Applicant are required to send all the documents stated above to our below official email address in other to apply for job here in our esteem organization. Tell No: +1- 305-563-7342 Human Resources Manager.